The only course of action was to use the casting power of the rod for which it was specifically built. The outfit is based on an imported South African blank that is 13 feet of high modus graphite slung with Fuji SIC low-rider surf guides and a Daiwa Japanese model tournament casting spinning reel mounted in the low position. The bottom line of the outfit is that after countless hours of “Off the Ground” casting practice I could occasionally manage to send a sinker out over the 150 meter mark. I went through my standard practice routine and managed to launch half a squid head clipped into an aerodynamic position behind a 150 gram grip sinker well out into the channel leading in from deep water. I placed the rod into the holder and waited for the weed. With the extra distance the line stayed weed free so I proceeded in cubing my pilchards intended as salmon bait into a burley trail. After two hours without a single tough the tide had reached its peak and was just beginning to run out. I was growing tired of the fresh bait changes every 15 minutes and the handful of cubed pilchards thrown into the back wash every 10 minutes. Constantly watching the glow stick on the rod tip can be mesmerizing and you can begin to imagine bites that aren’t really there. The first extraordinary tip movement you usually put down to your imagination and it is only the second movement that registers as the fumble of a Jew picking up the bait. I pulled the rod from its holder to confirm that there was definitely something interested at the business end of the line and after a few four letter expletives of encouragement the run was on. 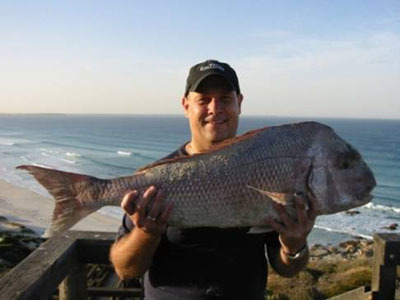 The nights fishing didn’t go according to plan but a snapper is always a welcome bonus.